No matter which angle you take to view these one-of-kind earrings, you'll be met with a clear message of faith. When you look at this pair from the front, you'll see a contemporary cross with a clean cutout design. However, when you view them from the side, an entirely different symbol of faith emerges: the ichthus. This fish-shaped motif was used as a secret symbol by the early church, allowing Christians to identify one another during a time of persecution. The combination of these two symbols in this modern 14K yellow gold pair presents a message that's clear from any angle. Earrings measure 19mm x 13mm and weigh approx. 2.9 grams. 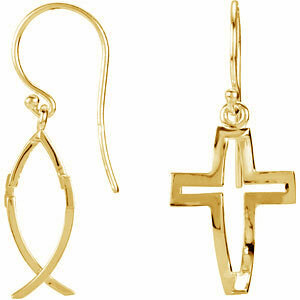 We guarantee our Crossfish Earrings, 14K Yellow Gold to be high quality, authentic jewelry, as described above.